The term "remuneration" means compensation or pay, but it has a broader meaning than just basic pay. It can also include not just base salary or bonuses but commissions and other payments, as well as deferred compensation or benefits paid under the terms of an employment contract. It's important to understand how each type of remuneration needs to be accounted for in terms of taxes, so that you don't underpay or overpay and make sure that you claim the remunerations in the appropriate tax years, using the correct forms. Businesses can set up their own remuneration systems as long as they comply with federal and state laws. It goes without saying that businesses should treat their employees the same regardless of race, gender, and other issues to avoid discrimination and lawsuits, always assuming they work in the same type of position or capacity. Certain employees might be entitled to specific amounts of remuneration based on practice and policy even without a written contract. What Are Typical Types of Remuneration? The type of remuneration or compensation an employee receives depends mostly on the type of worker he is and/or the type of work he's responsible for. A is paid to an exempt employee for work she's done. It's usually expressed in annual terms, such as, "She earns a salary of $50,000 a year." Salaries are paid out either weekly, monthly, semi-monthly or 24 times a year, or every other week which works out to 26 times a year. Salaries are paid even during vacations, holidays, and paid leaves of absence, but not during unpaid leaves. Some salaried executives have that specify the amount of salary they will receive. Owners of S- and C-corporations who work as employees within the business are typically paid salaries in addition to dividends based on the corporation's profits. Some employees are paid at an hourly rate, and only for hours that they actually work. Hourly workers are usually in jobs—anything from factory workers to clerical staff. Salespeople are usually paid on a commission basis. They're compensated based on their sales over a period of time, usually a percentage. Some salespeople are but they would still be paid commissions. Some employee benefits like unemployment and worker's compensation are mandated by state or federal law. Other benefits are determined by the company. Some paid-time-off benefits are part of the employee's salary or hourly wage package. Some other payments to employees are also considered to be remuneration. For example, if you and you don't require those employees to provide you with receipts, you're effectively giving them additional remuneration or benefits. Employees might be paid bonuses at various times and for various reasons. Some bonuses are performance-related while others are given to all employees in the company or to a work group at the end of a big project or a particularly good year. Holiday bonuses are also common. Incentives are motivational. They're rewards, a "thank you" for work well done or above and beyond the call of duty. Incentives are often bonuses, but this type of compensation can also include raises in either salary or hourly rate, recognition awards, and service awards. Incentive programs are a common method used to and they can include non-cash gifts such as trips or wellness programs. 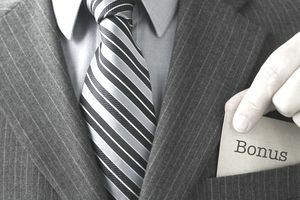 Many companies offer both cash and non-cash incentives to executives, including stock options. With the exception of employer-paid health insurance benefits, virtually all types of remuneration or compensation are taxable to the employee. The value for each type of compensation is easy to determine for regular pay, benefits, cash , and cash incentives, but the taxable value of non-cash incentives can be more difficult to pin down. The Internal Revenue Service provides a booklet, , that serves as a fringe benefit guide and can help you sort out this complicated issue. Check with your tax professional for more details on how to pay and report remuneration.